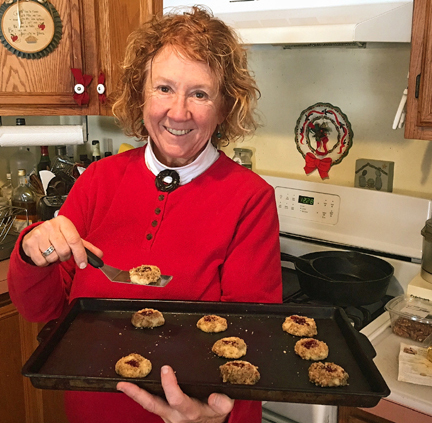 Laurie Neely of Orange, Massachusetts, has been baking holiday cookies since the day after Thanksgiving. By Christmas Day, she will have turned out hundreds. “There will generally be in excess of a dozen kinds [of cookies] and many dozens of each,” she told me in a recent interview. An artist, writer, and animal lover, Laurie started baking seriously in the 1960s as a stay-at-home mother. The Christmas-cookie tradition began with a family recipe from her first husband, who is still a good friend. Laurie has added recipes from friends, relatives, newspapers, and the internet to her repertoire over the years, adapting them to her taste. Many of these holiday treats—including her pfeffernüsse cookies and the German molded cookies called springerle—need to age in order to achieve optimal flavor and consistency. Her gingersnaps take about three weeks to mature. “And my husband Ray is, like, ‘Don’t give them all away!’” she added. Her family celebrates the season on Christmas Eve with a festive brunch that includes many, many cookies, she said. Her adult son is Jewish so this year the feast will include latkes for Hanukkah; that holiday begins on Christmas Eve. When we spoke Laurie was baking a new-to-her recipe, wine cookies flavored with anise. The recipe came from her friend Gail and before that from Gail’s mother Mary and grandmother Emilia. “Mary was an outstanding cook, and I am honored to use not only many of her recipes, but her KitchenAid mixer and quite a few other kitchen items as well,” said Laurie. The photograph of the recipe resides in a special plastic bag Laurie treasures. Each year after Thanksgiving she reaches into the bag for the tattered, food-stained recipes that constitute her evolving Christmas-cookie tradition. Her advice to novice bakers is to buy quality ingredients; to use good pans (she relies on silicone mats for her cookie baking and favors insulated cookie sheets); and above all to relax, have fun, and be flexible with recipes. “You need to stay with the basics. Your ratios of flour, shortening, and liquid are going to be crucial. But then you sort of play. The creativity makes for some pretty good cookies,” she suggested. 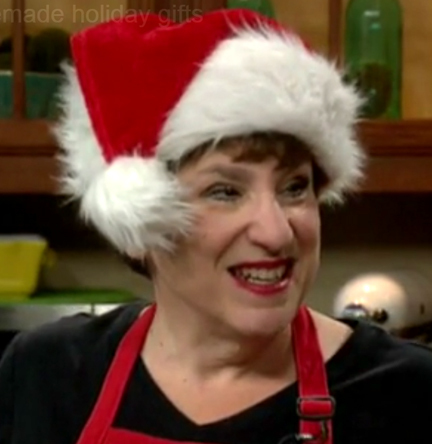 Laurie Neely loves the Christmas season and doesn’t plan to stop baking anytime soon. 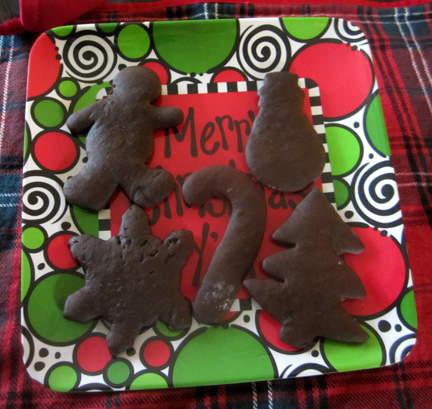 Here are two cookie recipes from Laurie’s kitchen. I don’t have anise seeds in the house (and I’d have to order them specially) so I’m holding off on the wine cookies until next Christmas. The gingersnaps are aging in a tin as I write, however. I got a late start on my baking so they won’t be ready to eat in time for Christmas—but a cookie might taste pretty good in the new year! 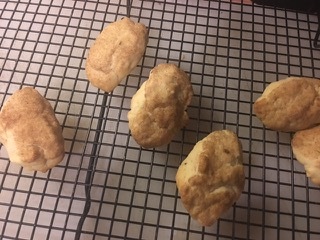 Laurie Neely decided, “I may add a drop of anise oil or extract in the next batch [of these cookies]….They are light, mildly anise flavored, sweet, and just a little biscuity, leading me to think they will age well. In a bowl combine the sugar and the shortening. Stir in the anise seeds, the oil, and the wine. In a separate bowl combine the flour, the baking powder, and the salt. Add the flour mixture to the sugar mixture a little at a time until the combination achieves the consistency of not-too-firm pie-crust dough. Shape the cookies by forming heaping tablespoons of the dough into logs in the palm of your (mostly closed) hand. Dip the tops of the cookies in a mixture of cinnamon and sugar, and place the logs on greased cookie sheets. Bake the cookies until they are a deep golden brown, about 15 to 20 minutes. Makes about 3-1/2 dozen cookies. Laurie took this photo of some wine cookies cooling. Laurie has adapted this recipe over the years, adding more and more ginger to achieve just the right flavor. Combine the dry ingredients in a bowl. In a large saucepan, melt the butter in the molasses. Bring this mixture to a boil; then let it cool. Stir in the dry ingredients. Chill the resulting dough for a couple of hours; then preheat the oven to 375 degrees and roll the dough out on a floured board until it is 1/8-inch thick. Cut out shapes with a floured biscuit cutter or floured seasonal cookie cutters. Bake the cookies for 8 minutes. The yield depends on the shapes you use to cut them out; Laurie Neely usually gets 3 to 4 dozen cookies from this recipe. Store the cookies in a tin for at least three weeks before serving them. Gingersnaps at our house, waiting to mature. Can you tell that I’m not the world’s greatest cookie cutter? This entry was posted on Wednesday, December 21st, 2016 at 10:06 am	and is filed under Cookies and Bars, Holiday Foods. You can follow any responses to this entry through the RSS 2.0 feed. You can leave a response, or trackback from your own site.